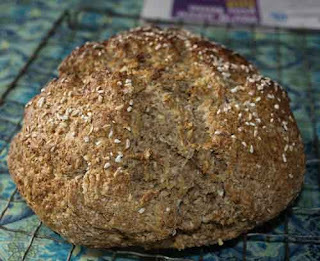 There were a lot of Irish Soda Bread recipes on the web last week celebrating St Patrick's Day. I really like soda bread, so I thought I would make some too. Preheat the oven to 190C/Gas Mark 5. Grease a baking tray. PUt the flours, oatmeal, bicarbonate of soda, salt and sugar in a large bowl and mix. Beat the egg and buttermilk together and add them. Mix with a fork and then your hands to form a smooth dough. Shape the dough into an oval, add a dusting of flour, brush wiht milk and sprinkle with oats. Use the blunt side of a knife to make indentations diagonally across the bread. Bake for 50-60 minutes, then put on a wire rack to cool. I found the oven was too hot as my bread had a bit in the middle that wasn't quite cooked, I had to take it out after about 40 minutes or it would have burned. I'll try again with a cooler oven. It does taste fantastic though, the real deal! That looks like a wonderful crusty loaf of soda bread. Yum! I love soda bread too, Janice! I made a loaf, sliced it up and froze it so I will eat just a slice instead of the whole loaf! Me again... I noticed you do not include currents/raisins or caraway seed in your soda bread. Since you are a lot closer to Ireland, I guess yours is closer to the original. This looks so good. I'm going to have to try soda bread using oatmeal as I've seen so many others using this. I love soda bread! I'm going to give your recipe a go! What is the wholemeal flour? Can I use wheat- or wheat pastry flour? Wholemeal flour is 'brown', it has all the bran in it as well as the wheatgerm. I checked on a conversion terms website and it is described as 'wholewheat' It will work with any flour even all purpose white, but is better with the wholemeal. Enjoy.